D-Link’s DWR-953 is inexpensive, but you’ll need to get a mobile data contract to make it a worthwhile purchase. How dependent you are on your broadband connection becomes glaringly obvious should you ever have it stop working for an extended period. This is especially true in a business context, where the flow of information in and out of the company is critical, and without that link, even remote diagnostics become impossible. Any decent disaster recovery plan should have an entire section allocated to the loss of internet connection, and it should probably include mention of a device like the new D-Link DWR-953. To confuse matters a little, D-Link already makes another router designated the DWR-953 that was a tabletop design with three antennas and only AC750 Wi-Fi performance. This ‘B’ version of the router has just two antennas and a much better AC1200 spec Wi-Fi. Is this an LTE router that you could learn to love? If you are looking for the very best Wi-Fi connectivity, handling numerous simultaneously connected users with MESH functionality, then the D-Link DWR-953 isn’t for you. 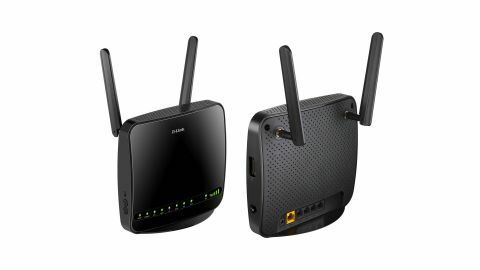 With just an AC1200 specification Wireless facility this is a modest Wi-Fi router that provides a dual-band single antenna connection with up to 866 Mbps for 802.11ac clients and another 300 Mbps for those still using 802.11n. It also supports 802.11g on 2.4GHz, should you prefer 54 Mbps or less speed. Without a spiders-from-mars antenna collection or USB ports, D-Link engineers have been able to make the DWR-953 a very compact box that measures just 19 cm wide and 17cm high. It sits on a small plastic foot that isn’t removable, and the unit has no wall mounting options. Inside the box is a short Ethernet cable for connecting the router to a cable modem via the WAN socket, a small external power supply with a couple of interchangeable power pins and two threaded BNC connectable antennas. The notes imply that these antennas are for the LTE technology and not Wi-Fi, but it might be that they do both frequencies ranges in reality. Or, the Wi-Fi ones are internal. Along with the WAN port are four standard gigabit Ethernet ports for wired networking, a number that has become the de facto standard for small routers. On the front face at the bottom is one of the longest collections of LED indicators we’ve ever seen. They cover power, internet, 5GHz service, 2.4GHz service, 4G, 2G/3G, LAN and WAN operation. And, there is also a stacked bar indicator to show exactly what signal strength you are getting on mobile communications, and even one to say if you have an SMS message. To see any lights on the mobile indicators, you need a full-sized mobile phone SIM inserted in a slot on the right-hand side. And, we realised that it only becomes active after the router is power cycled once the SIM has been inserted. The only other features of note are a WPS button and alongside it another to disable wireless functionality and a small hole to initiate a reset. Except for the SIM card slot, this is a by-the-numbers Wi-Fi cable router, with relatively few bells or whistles to its repertoire. If you’re buying this router for wireless speed, you need to do more research. Because even with AC1200 spec the connectivity is basic when compared with many other options. While it could support a handful of users to link them to cable broadband, the true purpose is to provide a simple means to get to the internet should the wired connection fail. And, it does that job rather elegantly. It’s also remarkably easy to get it operational as an LTE access point, as with a valid SIM and default settings you can be surfing via it in just a few minutes with zero configuration. On this LTE link with four bars, we managed 7.28Mbits down and 7.74Mbits up, which isn’t too shabby for a mobile service. In theory, if the LTE mast is just outside and few people are using it a 150Mbps downlink is possible. We experienced somewhere between 5 and 12Mbits from inside a building, within half a mile of the local LTE base stations. As this router has detachable antennas, mounting external antennas and cabling them to it would probably boost performance for those that use it as their single means to access the internet. In some locations near the base stations, this solution might exceed the local ADSL speeds available over copper lines, ironically. We’ve noticed that D-Link like to keep their firmware interfaces paired down to the minimum, presumably to avoid people selecting options they don’t understand and then demanding support to help them. The DWR-953 follows that trend, unfortunately. The security options, in particular, aren’t as extensive as business users might want. The router only supports WEP or WPA/WPA2 and no Enterprise option for example. The pages relating to the mobile chip control are also underwhelming, as they mostly relate to LTE in the advent of using a login controlled service. That it supports SMS messaging is interesting if a little pointless, as is D-Links decision to include USSD messaging also. These might be more useful if they automatically relayed them to an email or chat service, but it doesn’t. In our experimenting we discovered that it is possible to mess up the LTE fail-over mode by tinkering with the LAN/WAN options, so be careful with that. Ideally, the DWR-953 needs to be directly connected to the Cable modem, and have DHCP active. Getting to work in a wireless Access Mode and fail-over is more challenging, given the very limited documentation that D-Link provides. The quick installation guide is very sparse, providing very little more than admin login details, and almost nothing else of value. Undoubtedly the strength of this device is the LTE modem, which supports 2100/1900/1800/850/2600/900/800 MHz in FDD mode and 2600/2300 MHz in TDD. If those aren’t available the system will automatically downgrade to Pentaband UMTS/HSPA/HSPA+/DC-HSPA+ and as a last resort Quadband GSM/GPRS/EDGE on 850/900/1800/1900 MHz. That covers almost all geographic locations with mobile data services, should you move to another country and take this device with you. Firstly, as a means to circumvent a broadband issue, you need to consider that not all broadband problems are at the client end. It might be that the system is equally blocked across the LTE/4G service as it is over the broadband connection. Under those circumstances, this router might not solve the problem, even if it takes a different route across the internet. The other point that needs making is one about the cost of mobile data connections and how they’re not normally operated in the way that broadband connections are often abused. Should the broadband connection fail overnight initiating a switch to the mobile connection, and that is when offline backups are running, or Microsoft decides to flush another Windows 10 release down to you, then there could an issue with mobile data allowances. Without an all-you-can-eat mobile data contract, you could arrive at work with a massive bill for mobile data. And, even if you do, unless you have excellent local LTE service the backup might not have completed, and the new Windows 10 release finished downloading. As an emergency means to access the internal network remotely or send the odd email out a solution like this might suffice, but unless there are no other options, this isn’t an ideal replacement for a wired internet connection. Where this product shines is if you have an account with an LTE service, move to a new city and want to distribute Wi-Fi around a new office, home or apartment before cable or ADSL services are connected. At the time of writing, the new DWR-953 ‘B’ is available in Europe, the Middle East, Russia and Singapore, but it hasn’t yet been added to the LTE models available in the USA. The DWR-853 is a little too simplified for our liking. The lack of Enterprise encryption, no USB port and the limited Wi-Fi bandwidth all undermine its business potential. That said, if you want an easy to deploy fail-over option that ticks a few boxes in the disaster recovery plan, this is a highly affordable option.